My process is 100% intuitive. I give my subconscious mind and imagination full creative freedom and the “mak- ing” of the art becomes a meditative experience. Through painting, drawing, I cre- ate order on a two dimensional surface while processing my subconscious thoughts and feelings. In practising a daily creative ritual, things which bubble in my subcon- scious mind find expression through mark making, texture and colour. 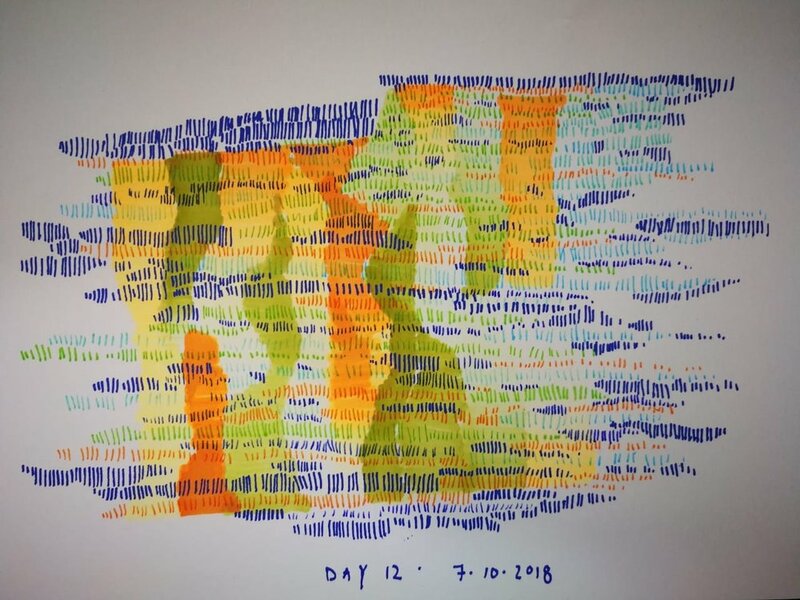 #100days_100lines is my second “100 day” project: Every drawing in this exhibition started off without any preconceived shape, char- acter or theme in mind. My process is “blind” and I often don’t look at the paper or switch between my left and right hands. Happy “mistakes” and spillages get ab- sorbed and incorporated into the work. The act of drawing becomes a two way conversation between myself and the work. I allow the marks to find their own forms and shapes as each image develops. In the final stages I enhance and accentuate certain shapes or froms. The image will then be worked on up to the point where it is well balanced, yet interresting in composi- tion.